The Midway Alignment project has collaborated closely with PBI Research Institute since the autumn. The goal of the collaboration is to create alternative business and financing models for the project. The research has been carried out in the so-called MABA project, an important support project for Midway Alignment and financed by Botnica-Atlantica. The collaboration is expected to result in strategies and plans for future infrastructure investments and also to improve the sustainable east-west connections in the Kvarken region. 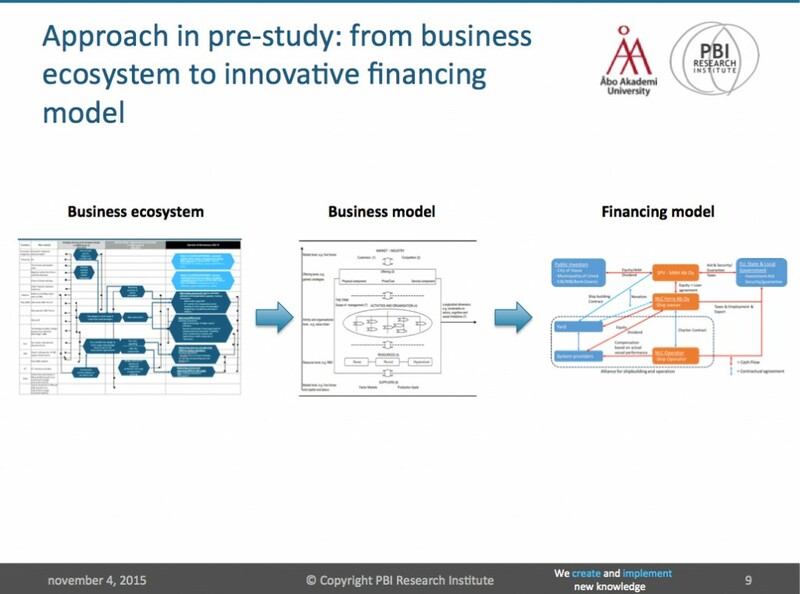 PBI Research Institute has, together with the project’s representatives and other actors, created a preliminary financing model for the financing of the system investment (i.e. the investments concerning the ferry and both ports). – The collaboration began as a result of internal and external needs. 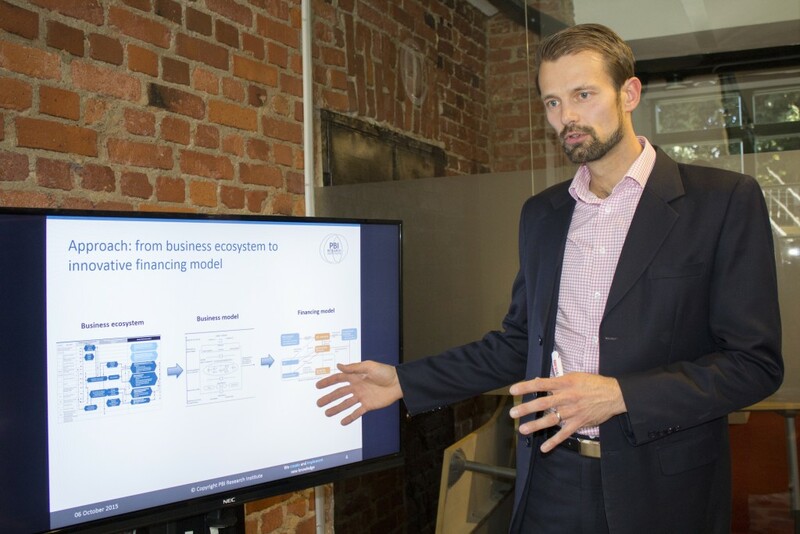 Internal in the sense that the project’s actors wanted to know more about financing models and possibilities. External in the sense that the project’s partners, states and the EU demanded a financing plan, explains Mr Mathias Lindström, Project Manager of the Midway Alignment of the Bothnian Corridor and Director of the Kvarken Council. The preliminary study mapped three important parts of the whole system investment. All parts of the study form a complete ecosystem, and the whole report is permeated by systems thinking. Anders Jungar from PBI Research Institute tells of the importance of systems thinking. The first part focused on the analysis of the Business Ecosystem; in other words, the whole project and the actors involved in it were identified. Furthermore, the influence of these actors, ways of influencing them and the benefits they can gain in the system investment were studied. The second part of the preliminary study consisted of an analysis of alternative Business Models. The workgroup was tasked with mapping different models that could work in this ecosystem. They analyzed various alternatives as well as weighed the pros and cons of creating a model that could maximize the benefits for the actors involved in the ecosystem. The third part consisted of a Financing Model and the different, available financing instruments. The workgroup mapped various financing sources and the structure of the whole system investment, both in terms of the forms of support and external financing. The collaboration has produced its first report. This picture illustrates how systems thinking characterizes all aspects of the report. – At this point, we have been able to create an innovative Alliance Model with both the public and private sectors, a roadmap for the involvement of different actors and a list of the relevant financing instruments. Moreover, we have attempted to find a model which would allow the distribution of risks between the public and private sectors. The Alliance Model is based on the distribution and handling of risks so that they are distributed amongst the actors who are best suited to handle them, explains Mr Anders Jungar, Project Manager of the preliminary study at the PBI Research Institute. –We want to emphasize that we have primarily analyzed the Midway Alignment project and its financing from a commercial viewpoint, taking into account the requirements set for it on a national and regional level as well as by the EU, Jungar continues. The collaboration with PBI will continue uninterruptedly to the beginning of 2016, when the application for phase 2 is submitted. – We have, for instance, detected some juridical and technical issues that need to be further analyzed. These findings make me very happy as a lawyer because they render the work a lot more interesting, Lindström adds laughing. PBI is a research-based management consulting company providing services to industrial clients, especially in the area of industrial investments and project business within energy and transport segments. We offer our clients a profound understanding of their industry through top-level academic research collaboration with various companies. We use our analysis and draw on our experience of industry stakeholders’ business relationships as a basis for our consulting work in developing the strategies of our clients and changing industrial logic. As a system investment, Midway Alignment requires new innovative thinking from both a technical, organizational as well as financial perspective. The key is to find innovative models for involving both the public and private sector in financing the system investment. The PBI team in this project consists of Dr. Kim Wikström, founder and managing partner of PBI Research Institute and professor at Åbo Akademi University, Mr Anders Jungar, project manager and Mr Johan Ingberg, financing expert.